a pretty in pink Christmas. 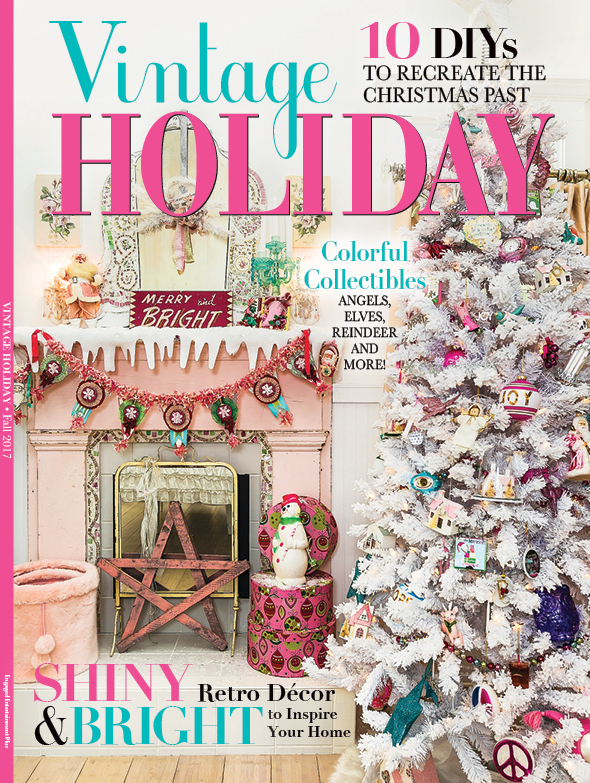 When the issue of Vintage Holiday magazine that featured my non-collection of vintage Christmas ornaments arrived in my mail box a while back I sort of fell in love with the pink Christmas scene on the front cover. Isn’t that pink chippy mantle to die for? 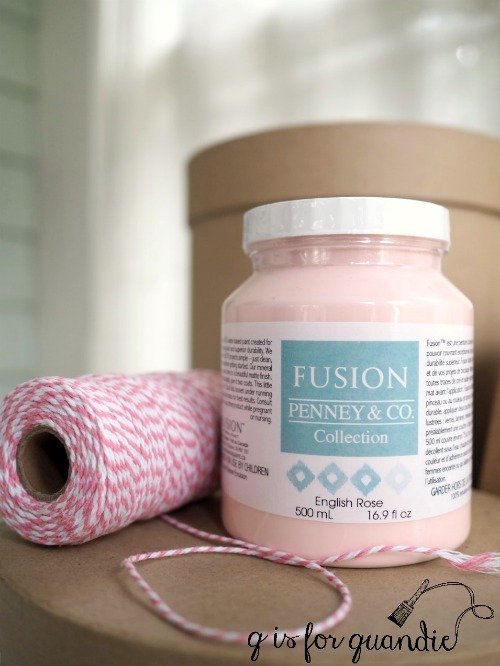 Following closely on the heels of the magazine’s arrival, the people at Fusion offered to send me some of their newest shade of paint, a gorgeous pink called English Rose. It seemed as though the universe was trying to tell me something, that I should plan a pretty in pink Christmas! So I started with making some gift boxes using the same technique I’ve used in the past for faux french hat boxes. 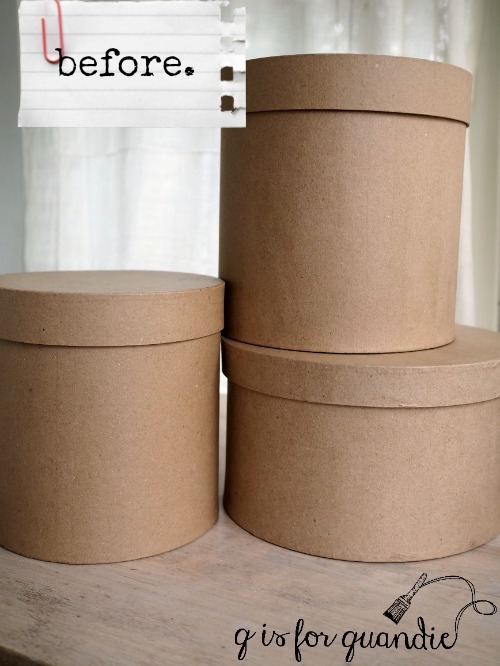 I purchased several plain cardboard gift boxes at Hobby Lobby. You can get these for just a few dollars each if you wait until they are on sale for 50% off (which seems to happen every 4 – 6 weeks or so). Next I simply painted some of them in the new Fusion pink, English Rose and one in Fusion’s paler pink, Little Piggy, for contrast. I painted each with two coats of paint. I wanted to use a Christmas themed graphic on them, and when I found these 12 Days of Christmas graphics on Etsy I knew they would be perfect. I purchased six of them from Project Printable for $1.50 each, so an investment of $9. 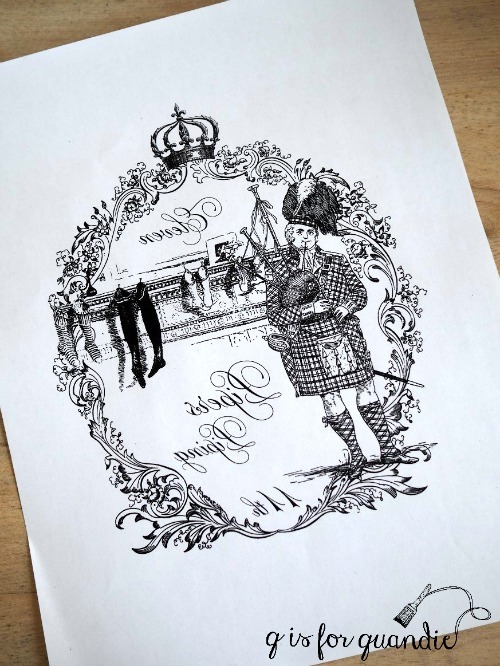 The seller conveniently provided a mirror image jpeg along with the regular jpeg so I didn’t have to worry about figuring out how to print a mirror image, which is what you need for a transfer. Slick, right? Yes, I know you can find free graphics online and I like to find those when I can as well, but sometimes it’s worth it to pay a little money for the convenience of finding exactly what I wanted. Next I used Fusion’s transfer gel to transfer the graphics to the painted boxes. 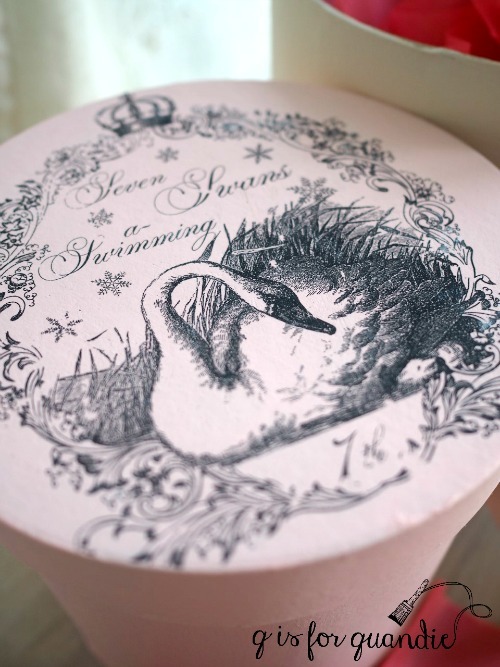 You can print a copy of the detailed instructions here: making a faux hatbox with transfer gel. And voila, I have pretty Christmas gift boxes that can be re-used over and over. Keep in mind that you aren’t likely to achieve perfection with this method of transferring a graphic. Some bits of your design will likely rub off. But perfection is seriously over-rated. I prefer to embrace a distressed, imperfect look. 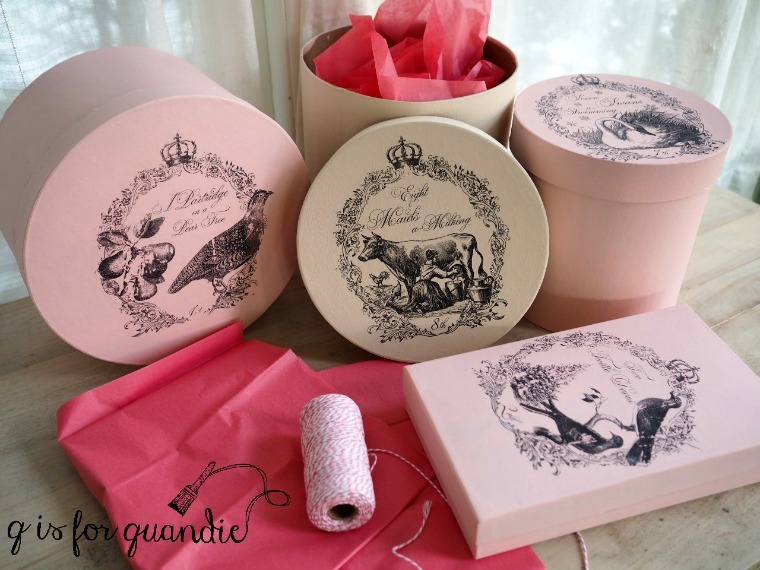 If any of you locals want to make your own pretty in pink gift boxes, Reclaiming Beautiful in Stillwater has some of the English Rose paint in stock while it lasts. Plus their holiday open house is this afternoon from 3 p.m. to 7 p.m. Stop by, have a glass of wine and do a little shopping. If your aren’t local, click here to find a Fusion retailer near you! Previous around the world in 6 hours. Next vintage sled, take two. Love these! 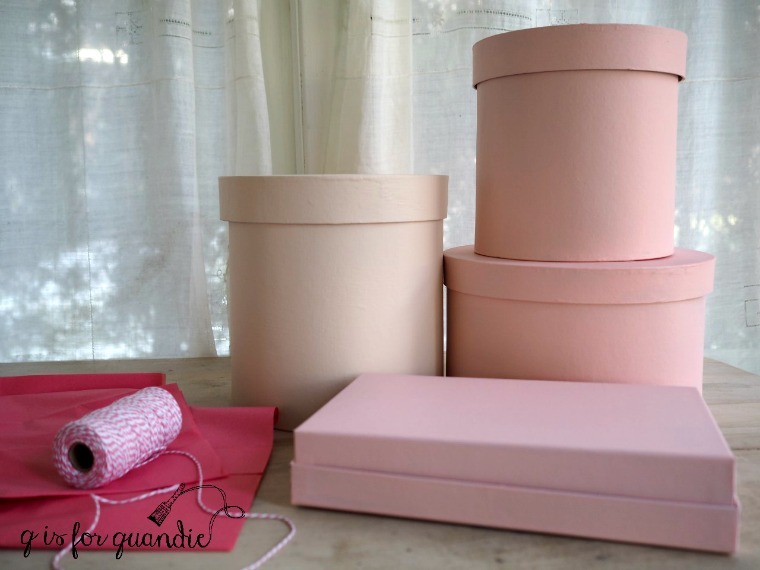 Great ideas for a pink Christmas. Thanks for sharing your inspiring ideas! I love these. I just sent for some burlap bags I want to add some trims to and use them as gift bags so that I can reuse them year after year. I love the twelve days of Christmas transfers. They are perfect. I see a trip to Hobby Lobby in my future. How fun! I bet you could do some cool things to dress up the burlap bags. I saw this new color at my local Fusion store last week – such a lovely soft pink! I love the inspiration for your Christmas look this year. The best part is giving it away as part of the gift, so you are free to have a NEW inspiration next year! Adorable in pink. Not a color I would think of for Christmas, but it works. I like that you keep introducing us to ideas and vendors that have products to use to add an additional layer of interest. I would not have thought to use Etsy for rub on transfer images. Oh, and I just read your reclaiming beautiful post and the antique mall I have my booth in has an open house tomorrow. Must be the season! It’s definitely the season! I’ve been working away getting stuff ready to bring in to sell at the shop, so I’ve got a few little project blog posts coming up. But now that will be winding down for me and I can start to focus on my own Christmas decor. I’m thinking of painting my kitchen chairs this color. Wouldn’t that be fun? I love that idea Stacey! This would be the perfect pink for chairs. Plus using the Fusion will make them durable and washable, definitely a plus for kitchen chairs. Very cute! Can’t wait to see your tree and house after it is all set up. It will fun to decorate at our house for the first time too. Fabulous color! Would be great as an accent color…I have several wooden boxes to paint that would be beautiful in this color. And a granddaughter who would love the finished product! We should get together and paint some boxes! These are so lovely – and can be used again in the future. What a terrific project! 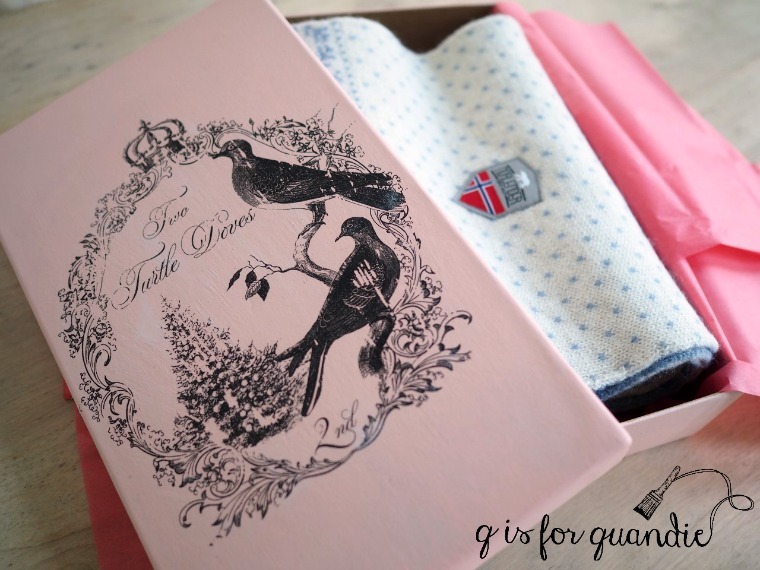 I like the idea that the packaging becomes almost another gift in itself. Hopefully the recipients will like them! I wish I lived local. Attending a holiday open house is the perfect way to kick off the Christmas season. Hope it’s a great success! Looks good! I haven’t had a chance yet to try this colour! 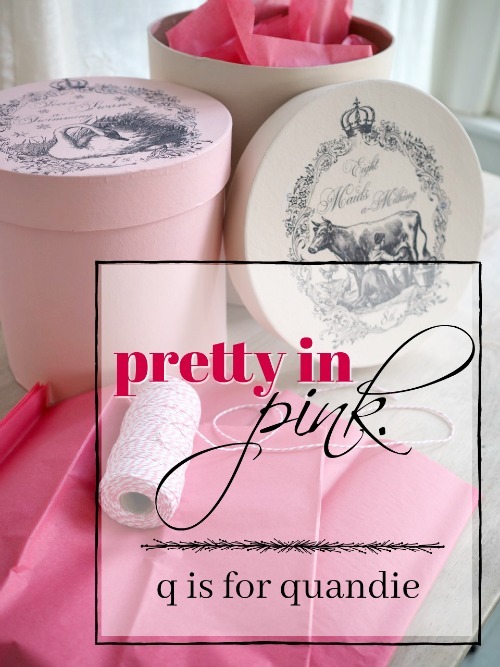 If you like pink you should definitely give it a try! It’s a lovely shade. That’s a lovely color, and I love how you added the graphics. Thanks for including the find a dealer link. I’ve been going way farther than I needed to as I was able to find a supplier just a few miles from my house. Oh my goodness! Well, I’m glad I saved you from continuing to do all that driving! pink. Can’t wait to see how they look under your tree with the vintage ornaments. I have a white tree and want to try this as I think it will look so unique and awesome. Thanks for sharing your creative ideas. Wow! I love those boxes! I am using my vintage ornaments for the first time this year. I don’t have a “collection” or should I say an “uncollection” like your lovely ones, but enough for a four foot tree. I can’t wait to see your tree with those boxes around it. It’s like you can read my mind Shelly! Well, at least the giveaway part 😉 I’m planning a giveaway for my blogiversary which is coming up soon, and it’s going to include a box and some of the English Rose paint. So be sure to stay tuned! LOL, I know how you feel Shelly. Although I did once win a TV in a work Christmas party drawing. That must have been my big moment! I love this color of pink! My daughter loves pink. I would love to paint her something in this color. I would like to see a piece of furniture painted this color (chippy) with dark wax. Thanks for sharing. That would be gorgeous. 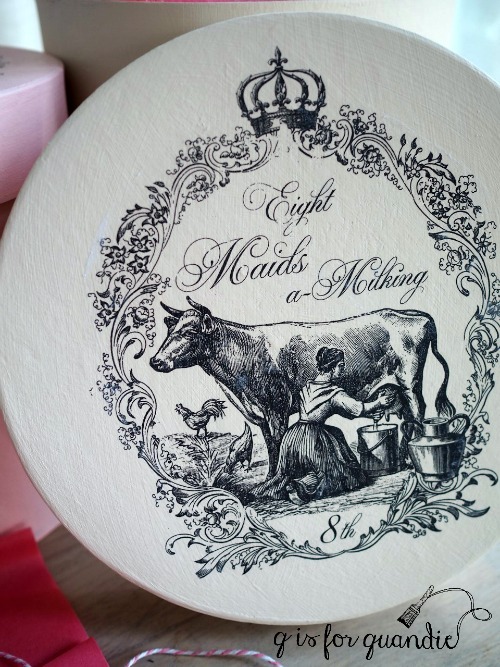 I need to find a milk paint in this shade of pink perhaps.